Let us tell you what is so good about our lotion! 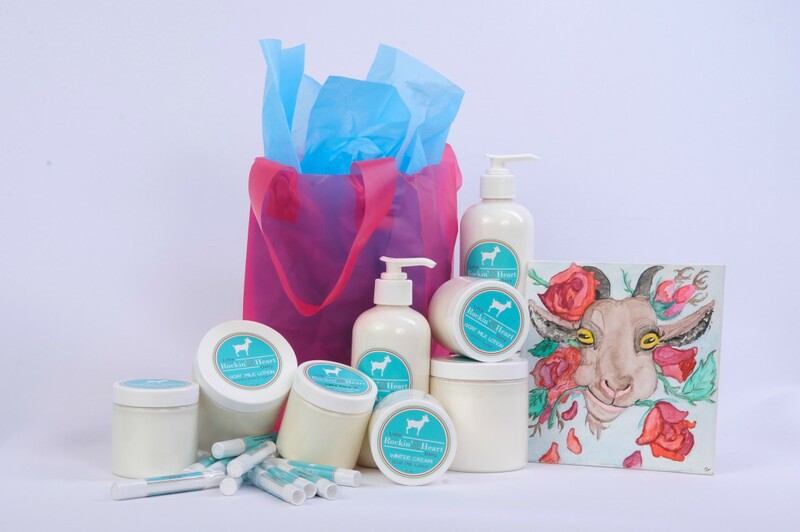 Little Rockin’ Heart Dairy Lotion will both moisturize your skin with Goat’s Milk and pure distilled water, luxurious additions of Shea Butter and other pure oils that will also seal in the moisture! Shea Butter is an all-natural vitamin A cream. Shea Butter is a superb moisturizer with incredible results in healing a host of skin conditions and also contains natural vitamin E. It is a powerful antioxidant, anti-aging and anti-free radical agent. Shea Butter’s properties of healing are so amazing that many of our clients claim that our lotion is better to apply after too much sun than Aloe Vera and that they do not burn so badly after sun exposure when using our lotion. Avocado Oil contains high amounts of proteins and unsaturated fats, both of which are beneficially strong skin agents. Avocado oil contains Omega-3 fatty acids – the very same that are found in fish oil. Avocado oil is high in sterolin, which studies have shown to facilitate in the softening of skin, reducing the incidence of age spots. It is rich in antioxidants, making it useful for healing sun-damaged skin. Antioxidants like vitamins A, D, and E in avocado cause the skin to be more supple and are particularly good for dry or aged skin. It also contains lecithin and potassium, which are all beneficial for the skin as well as the hair. Argan Oil is from Argan trees that produce a fruit (nut) that is used by native Moroccan people for their diet and skin care. The oil was once extracted from the nut after a goat ate the fruit. We no longer need to process the nuts through goats to get this wonderful oil. Many people who suffer with a variety of skin ailments, such as eczema, psoriasis, acne, and sunburned skin, report almost unbelievable success when using this oil.